This review has not yet been approved by the owner of this writing service. If you are the webmaster of Bestessayservices.com, please Contact Us to approve or remove this review. The website makes some attempts at modern design and impressive high-quality appearance. These are, however, severely undermined by hilarious typos (even in menus) like “Turban and Havard style”, poor quality of ubiquitous filler text the visitor is showered with, general cheapness and the fact they still haven’t got down to removing Christmas decorations from their menus. Prices are lower than the industry average: starting at $12 per page for high school assignments and going up to $32 for PhD level texts due in 3 days. The price is determined by how soon you need the paper and its academic level, but, frankly speaking, the gap between high and low level is suspiciously small. It is somewhat unlikely that they really have people at their disposal qualified enough to write for higher academic levels. Other services, such as proofreading, rewriting and editing, come with their own price ranges, but they are as unassuming as writing from scratch. Customer support is supposedly available via live chat, email and by phone. However, practice shows that live chat is constantly offline, emails don’t get answered, and no one picks up your calls. One can only wonder if it is just an occasional problem – or if the service is long dead. Surprisingly, there are samples of writers’ work on the site. It is surprising because if these were really written by the writers working for this company, it would be wise to try and hide any connection between them. Our best guess is that they are generally crudely compiled from bits and pieces of other texts with minor rephrasing, which usually leads to the text acquiring a somewhat delirious and disconnected quality. Weird turns of phrase, uncoordinated words, prepositions where there should be none and vice versa – all this doesn’t prevent you from understanding the general meaning of what is said, but certainly won’t impress your professor when you submit it as your own. 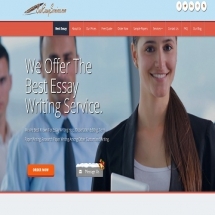 Direct contact between the client and the writer through the service’s messaging system. Yet another joke of a writing service with unclear reasons for existence. An awful website filled to the brim with nauseating amounts of poorly written filler text, even worse samples and peppered with rampant typos, probably non-functional customer support and suspiciously flat pricing curve. Prices are by far the only feature about BestEssayServices.com that is in any way attractive, but still look like a very dubious investment.